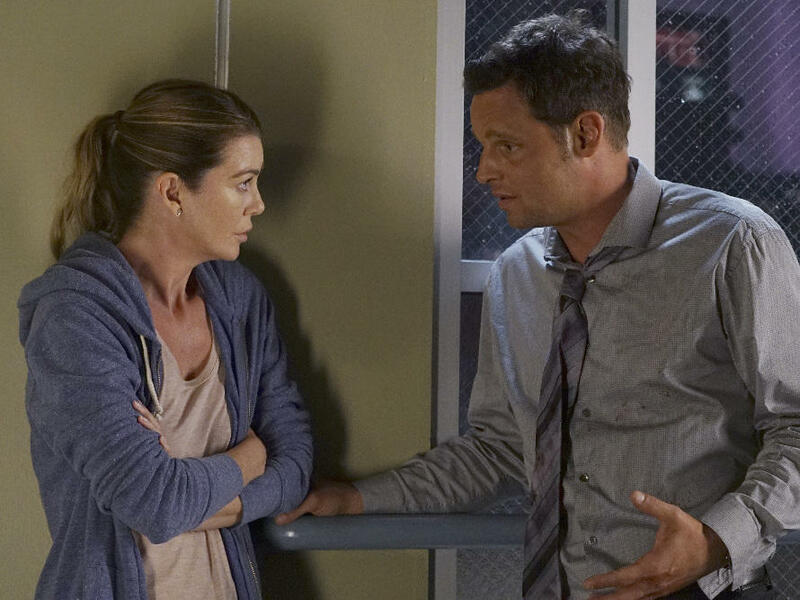 Meredith Grey (Ellen Pompeo) and Alex Karev (Justin Chambers) have been through a lot together across 13 seasons. Grey's Anatomy is back Thursday night for the second part of its 13th season. It's hard to last that long, but it does seem that Grey's is — in the words of a friend of mine — "unkillable." And when you press its viewers on their thoughts about it, you often get a clear-eyed, fully aware evaluation of strengths and weaknesses that add up to a habit that's endured for over a decade. I tend to be suspicious of fan analysis that's done without asking people why they like things, and I've been a casual, off-and-on viewer in recent years. So I asked people on Twitter who have stuck with Grey's to weigh in on the show's enduring appeal. If you look at that tweet and the many, many responses it received, there are some themes that emerge. One is that these folks are well aware of the show's sillier elements. They know that there's a lot of outrageous stuff going on, and an overdose of catastrophe for any real hospital. They get it. And in a snacking-on-salty-goodies kind of way, they consume the romantic plots of Grey's for pleasure — that's where you see heart eyes and strong feelings, lots of declarations of which couples are worth rooting for and which are not. But for a lot of fans, the heart of the show isn't the high-concept impalings and rare diseases or even the special episodes. For a lot of them, it's a show built on platonic friendships — especially but not exclusively among women — that are believable, relatable and familiar. And that's still true even among the high drama of the romances and the implausible plot drivers. The show's enthusiasts talk about these characters feeling like friends, feeling like people they know. And, of course, they talk about having watched for so long that there's no point in quitting now. On ABC tonight, a show returns to complete its 13th season. That is an impressively long run for any show, and just as impressive is the fact that lots of people are still tuning into this one. We're talking about "Grey's Anatomy." SHAPIRO: And our pop culture correspondent Linda Holmes is here to talk about why this TV drama has stuck around so long. Hi, Linda. SHAPIRO: So first remind people who haven't watched this show what it's all about. HOLMES: So "Grey's Anatomy" is a medical drama. It takes place at a Seattle hospital. And it follows a group of doctors and some of their friends and romantic associates as they, you know, battle against the demands of being a doctor and also, of course, kiss and do other things, you know. It's one of several shows running on ABC that's under kind of the umbrella of Shonda Rhimes, who's one of the most powerful producers in television now. SHAPIRO: She also does "Scandal" and other shows. Lots of hospital dramas have come and gone from television. What's the secret sauce for "Grey's Anatomy?" HOLMES: ...And, you know, any other bodily fluid that you might want to name because they do have a lot of fairly gory scenes and things like that, so the medicine is very exciting. They have a mix of kind of medical stories and personal stories. They have such a big cast that it's been able to kind of rotate through. They can survive people leaving. And Shonda Rhimes has been merciless about being willing to get rid of characters in a wide variety of reasons, to the point where if this were a real hospital, the title of the - of any article about it would be, like, "Doctors Meet Catastrophes Endlessly At Cursed Hospital." SHAPIRO: You would never go to the hospital because so much bad stuff happens there. HOLMES: You would - it's cursed. They have had shootings at the hospital. They've had natural disasters. They have had, you know, car accidents of very strange kinds. People get impaled with all sorts of objects - with antlers and poles and all kinds of things. It's very gory at times. SHAPIRO: So you asked on Twitter why people are still watching this show after 13 seasons, and what did they tell you? HOLMES: The things that I heard about the most were - one is the diversity of the cast, both in the sense that there's a lot of racial diversity among this cast, but also in the fact that there have always been a lot of LGBT characters, and they've been treated with a lot of respect. The other thing that people talked about the most with this show is this undercurrent of friendships among, particularly, the women characters on the show. So where you have these catastrophic, kind of crazy external events and you have these very dramatic romances that are very changeable, the constant all the time is these deep friendships among these women doctors. And that is really the touchstone for a lot of people. They consider the - you know, the accidents and the disasters to be unbelievable and dramatic, but they consider the friendships to be deeply believable and real and relatable. SHAPIRO: I know you haven't watched every episode for the last 13 seasons, but when you do come back and watch it, do you still find it appealing, even all this time after it started? HOLMES: I do. It is a strongly written and acted show. And as with a lot of things that are part of a genre - right? - in this case, a medical - kind of a medical drama - so much depends on execution. I think that if you look at the times that networks have tried to duplicate the Shonda Rhimes formula and failed, you can see how good she is at what she does and how carefully she sets up those characters and balances that reality and unreality. SHAPIRO: That's Linda Holmes, host of the Pop Culture Happy Hour podcast, on the return of "Grey's Anatomy" in its 13th season. Thanks, Linda. HOLMES: Thanks, Ari. Transcript provided by NPR, Copyright NPR.